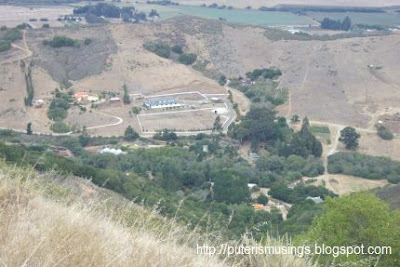 This is the view from the top of the ranch. That's Morro Rock in the distance. 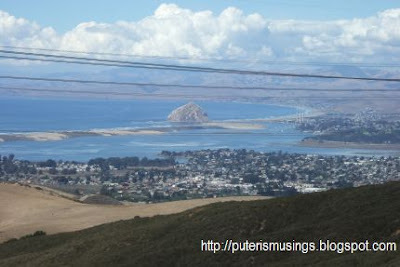 Morro Bay is a popular destination in the summer especially for folks who live the baking hot areas of Fresno. It's hard to get a hotel room there in the summer. That's the neighbor's horse ranch property adjoining the family property. 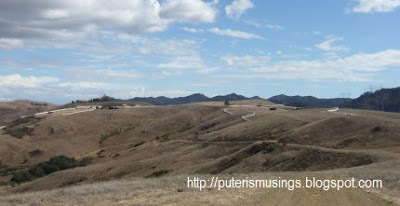 The picture above and below is how the landscape looks like in the summer. 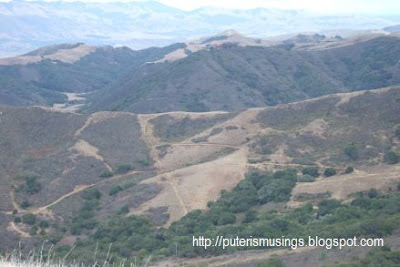 It does look very dry, but in the winter where there is a lot more rain the whole place will look green. Doug and I hope that maybe some day in the future we'll get to live here! :-) Keeping our fingers crossed! We chose a gully to do our target shooting. It was a pretty windy day, but it was slightly better in the gully. 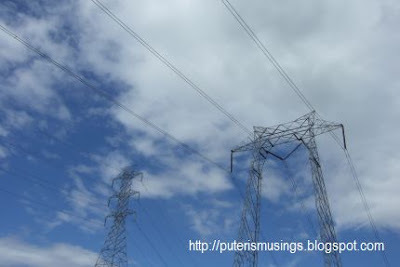 Right over head are these high tension wires, crackling with electricity! And I do mean crackling! The first time Doug brought me up to the top of the property beneath the high tension wires, I had this fear of getting electrocuted! The source of the electricity is the Diablo Canyon Nuclear Power Plant. Doug and Duncan walking towards the bottom of the gully. Duncan had all kinds of weeds and stickers on his clothes! I didn' t wear any socks so I didn't have any stickers on my socks but some managed to get into my shoes. I did the first rounds of shooting with my .380 calibre semi-automic Beretta 85. 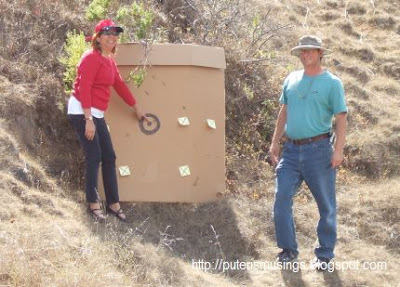 Doug had brought a piece of cardboard and drawn a bull's eye and stuck some sticky notes with Xs on the board. Not bad for someone who hadn't fired a shot in many years! I manged to shoot one in the nine ring and 5 others were on the board. Two must have gone in the dirt. 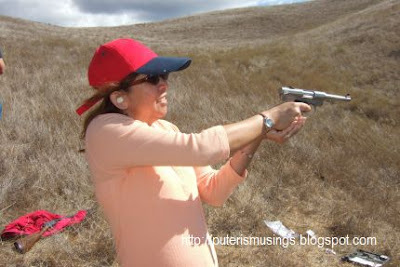 :-) The Beretta's recoil was stronger than I liked. 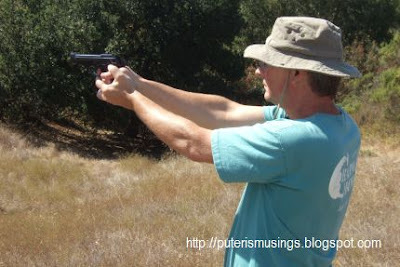 Doug had his turn with the Beretta. Dwight is a friend of ours who lives on the property. He helps us look after the barn that Doug has there. Here is Doug firing Dwight's Iver Johnshon .32 calibre revolver. That revolver is about 75 years old. Dwight said, " I love the smell of gun powder!" Haha. 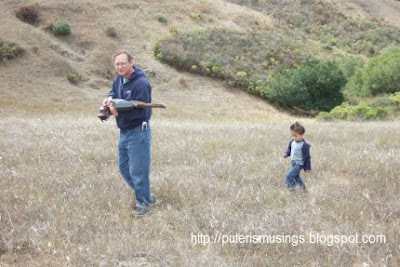 Here's Dwight showing me how to handle the .229 calibre Rossi pump-action rifle. 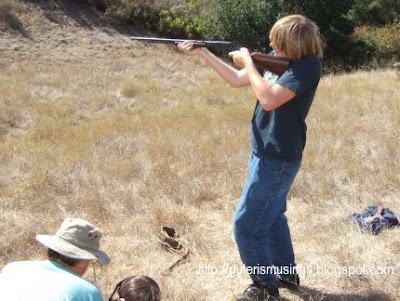 Put your cheek agains the stock, lean your face towards the gun, and use your fingers like a tripod to help stabilize the gun. I love firing this rifle! The act of pulling back the pump and pushing it forward to load the cartridge was the most fun part. Makes me want to say, "Go ahead, Punk. Make my day!" The Rossi was also a very accurate shoot. 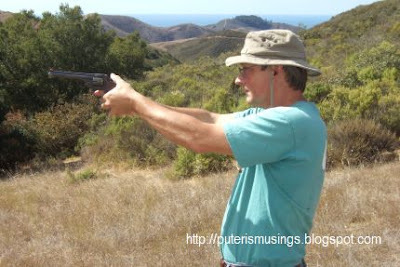 Here's Dwight firing his 75 year old revolver. When we met him at the ranch, he already had his revolver in a holster on his hip. I asked him why he had his revolver with him. There's a guy living nearby who is quite the trouble maker, and Dwight doesn't want to be caught off guard. Duncan felt left out and wanted so much to fire a gun. Of course I said, "No!" He cried and sulked and Doug let him pull the trigger of his .22 calibre Ruger Mark 12. Made the boy's day! Duncan also "pulled" the trigger to the Rossi rifle. I have a video of him doing it. 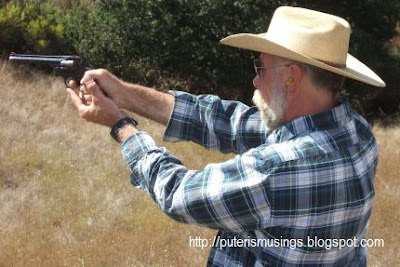 The last pistol I fired was Doug's Ruger Mark 12 .22 calibre sem-automatic. I did not fire Dwight's old revolver. Dillon, Doug's 15-year-old nephew, came with us. He was the only left handed person in the group. I don't think he has ever fired a real gun before but he was the only one in the group to hit the bull's eye! Dwight was really good too and his shots were only around the nine ring. Besides shooting at the board, we shot into the hill side just to see the dust being stirred up by our shots! Heheh. Ammo is cheap! Recoil...that was the word i was looking for when i asked about the gun shooting thingy at the previous post. 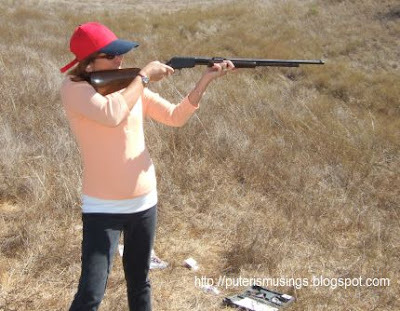 I guess practise make perfect ...in order to handle the recoil. hehe...will start saving for trip to US. But maybe, there is chance for a visit, cause my sister is in to golf...so she might had over to the States for golf and studies. 75 year old pistol...wow..he really takes care of the pistol. 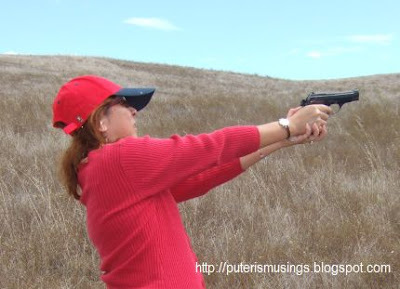 The Beretta gives quite a recoil. There are marks on my hand where the pistol hits it. I only fired one magazine load of ammo, imagine if I had fired more?! I think for a guy who has larger hands and stronger than I am, I don't think it should be much of a problem. Sure, any time you are in the US. You have an open invitation! How about when coming over on your honeymoon? Heheh, better start saving now! I don't know where Dwight got his 75-year-old revolver. Yes, that revolver is older than he! Don't worry... it was firing blanks, and this was on a school field trip to the army camp. I brought some empty bullet shells home as souvenir but being that young and stupid, our whole class was afraid the bullets would blow up and I ended up throwing them away. Haha, afraid of bullet shells! Why not, eh. In M'sia punishment is hukum mati for illegal possession of weapons. Even cannot be caught with live bullets! Even if there is not gun! Stupid law. And then the criminals manage to get guns, and kill innocent people when robbing them. "In M'sia punishment is hukum mati for illegal possession of weapons." Really? Then why do they keep releasing criminals who commit armed robbery after their jail term? They should be dead by now, but you still here of criminals being released. Criminals get their guns for their criminal activities! But for peaceful folks, just to get a gun carry permit also almost impossible! 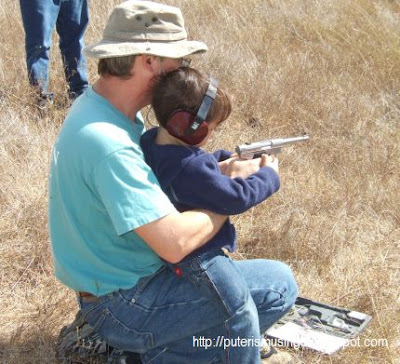 No need to say permit to own a gun! Ian, is that true that armed robbers get released?! I am surprised! I remember this poor guy in Miri many years ago, held for so many years just for illegal possession .. didn't even use it in a crime. Some of the armed robbery cases were committed by people that were known to have committed crimes before, as per reported by the papers / police press conference. You think a 75 year old pistol is old? I have my grandfather's old double barrel shotgun which is more than 100 years old. My cousin has the rifle my great-great-grandfather carried in the Civil War (1861-1865). Still operable. 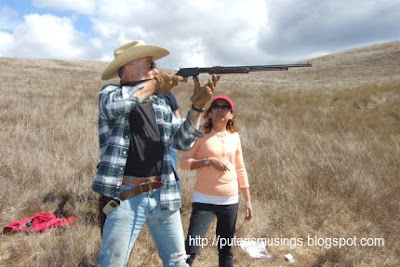 One of the fun things I would like to get involved in is "Cowboy Action Shooting" where you dress up like a cowboy and shoot at badguy targets with old guns (or modern copies of old guns). The setting is a fake old west town and the targets pop-up in windows, doorways, etc. This is a spectator sport and people watch from a viewing area.